The rock scene is rife with performers who were either ahead of their time or a lot more influential than their record sales would indicate. This week's album is one by a group who were both and yet one of the least prolific bands on the music scene. They are The Blue Nile, and they are out with only their third album in nearly thirteen years, a CD entitled Peace at Last. The Blue Nile are a trio from Edinburgh, Scotland, who in 1983 made a fascinating album called A Walk Across the Rooftops. The record was a wistful, atmospheric opus that combined impressionistic lyrics, a plaintive vocal style, and a fascinating sonic approach that incorporated synthesizers and unusual treatments that would long precede so-called "ambient" pop, and even much of the New Age scene. While their debut album only sold about 50,000 copies each in the US and the UK, the Blue Nile attracted quite a few fans among other musicians, including Peter Gabriel. A band called Grace Pool covered one of their quirky songs, and Rickie Lee Jones became a prominent Blue Nile fan, touring and recording with them. After that hopeful start, it was nearly six years before the Blue Nile followed up their debut recording with one called Hats. Part of the reason for the delay was a contractual tangle with the record company that kept them out of the studio. Hats also got critical raves, including from this reviewer. The record continued the group's atmospheric sound, and explored some new directions. On Hats The Blue Nile seemed to draw a bit, though very indirectly from R&B, in the manner of Van Morrison's hints at soul-era music in his more atmospheric efforts. Now, nearly seven years after Hats, when the group's fans had virtually given up hope of another Blue Nile albums, they have released Peace At Last. Once again, it was a contractual tussle with record companies that kept out of the studio. Actually, they did record a whole album in this period, but being described as "unsatisfactory" it was never released. So they eventually changed record companies again. Principal songwriter Paul Buchanan ended up moving to Los Angeles for a couple of years. Meanwhile, the group almost broke up and may still do so. The band's rocky relations led Buchanan increasingly to dominate the creative process, so Peace at Last is primarily his work. An interesting thing has happened since their last release: the pop music world -- or at least some of it -- has caught up to the Blue Nile. The group's brand of atmospheric, moody music has caught on among artists ranging from Suzanne Vega to Tears for Fears to the ambient dance scene. Thus, one would expect something approaching mainstream pop from The Blue Nile this time around, but again they have gone their own way. Their music remains moody, impressionistic and sometimes brooding, but they have moved to a much more scaled back, acoustic sound on Peace at Last. They have also set off in some unexpected directions, with more distant R&B influence filtering in through the grey Scottish Highlands. Again the songs are interesting but very elliptical lyrically, with the words rarely stating facts, but more hinting at feelings. Buchanan delivers the songs in his yearning, wistful voice that is a major factor in the Blue Nile's moody sound. But this time around, he also tries some things that don't work very well, like going into an affected falsetto reminiscent of Prince. Despite the uncertain status of The Blue Nile as a band, rest of the group remains from the last album with bassist Paul Bell and keyboard man, Paul Joseph Moore. The drummer on this recording is Nigel Thomas, though as on past Blue Nile releases, a drum machine can make an appearance, being used in unexpected ways. The new album was recorded in Dublin, Paris and Los Angeles, according to the record company, and Buchanan is quoted as saying the group avoided trying to make a record that was "abstract or majestic." Buchanan described the instrumentation as including an beat-up guitar, and an old organ bought second-hand. The album definitely has a more intimate sound than their previous efforts, with the arrangements and sonic treatments usually shying away from the expansive, spacey sound that marked their previous work. Instead, the atmospheric quality is imparted by the impressionistic songs themselves. While Peace at Last provides for pleasing listening, from an artistic standpoint, I think it is least of the Blue Nile albums. With the rest of the world, so to speak, having caught up to the Blue Nile, they have less of an impact when they do the kind of things with which they established their reputation, and when they try other directions, the results are not always as successful. I find there is also a bit of sonic sameness to some of the tracks, especially given the way the album is sequenced, which occasionally puts two similar tracks next to each other. 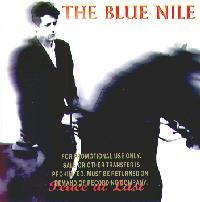 Still, The Blue Nile remain champs at evoking a wistful, rainy-day mood. Peace at Last, the new album by the somewhat elusive and very unprolific Scottish group The Blue Nile is a mixed blessing. They still make interesting and evocatively moody music, the new album lacks the innovative quality of their previous two releases. Part of the reason is that what The Blue Nile did a over a decade ago is now becoming more commonplace. They do try to explore new areas, but they are not always entirely successful. And some of the songs seem a little one-dimensional. Still, the Blue Nile's music is more than the sum of its parts. While they may make a few minor artistic stumbles, the overall effect of their music still comes off as both appealing and distinctive. Sonically, the album lacks the innovative quality that marked their previous work, but the intentionally more direct, unadorned, and as they describe it "visceral" sound is effectively reflected in the mix. Perhaps as a result of that intention, the stereo separation is sometimes rather narrow, imparting a shallow quality to the sound. But there is a decent amount of dynamic range, given that it's a major label release, which almost always have some degree of audio compression. Those who patiently waited for nearly seven years for the Blue Nile's third album are probably not going to be disappointed. They still maintain important elements of their trailblazing sound. And with pop music moving in the direction of this band's style, Peace At Last could well be their best-selling release yet, but I doubt this record will have the degree of influence of their early work.